Cubes provides simple but extensible mechanism for authorization through an Authorizer and for authentication through an Authenticator . Authentication in cubes: determining and confirirming the user’s identity, for example using a user name and password, some secret key or using an external service. Authorization: providing (or denying) access to cubes based on user’s identity. The authorization principle in cubes is based on user’s rights to a cube and restriction within a cube. If user has a “right to a cube” he can access the cube, the cube will be visible to him. Restriction within a cube is cell based: users might have access only to a certain cell within a cube. For example a shop manager might have access only to sales cube and dimension point equal to his own shop. There is only one build-in authorizer called simple. 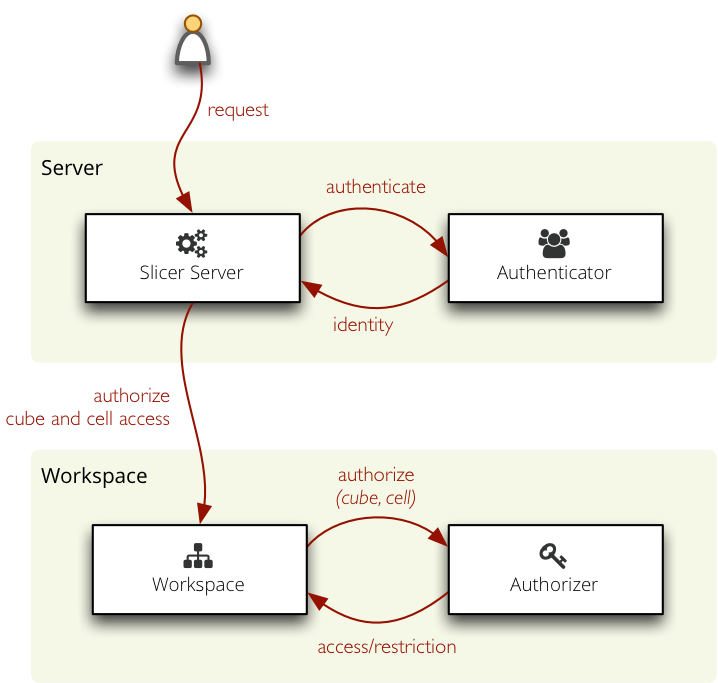 Simple authorization based on JSON files: rights and roles . The rights file contains a dictionary with keys as user identities (user names, API keys, ...) and values as right descriptions. The roles file has the same structure as the rights file, instead of users it defines inheritable roles. The roles can inherit properties from other roles. The rights file of the simple authorization method might contain a special guest role which will be used when no other identity is found. See the configuration documentation for more information. Authentication is handled at the server level. http_basic_proxy – permissive authentication using HTTP Basic method. Assumes that the slicer is behind a proxy and that the password was already verified. Passes the user name to the authorizer. © Copyright 2010-2015, Stefan Urbanek. Revision 9cb07971.